The social service activities are learning and enriching experience for all of us. It helps to develop love, respect and understanding and in realizing how we can make a difference in the lives of others. On 27th April, 2014 Social Service Day was observed for Classes 6 to 12. A day is set for Social Service in all the Three Sections of the School, where in the students visit various centers distribute food items, toiletries and entertain them. Students visited different NGOs and slums which included shelter homes, special schools and the slums in the neighbourhood. 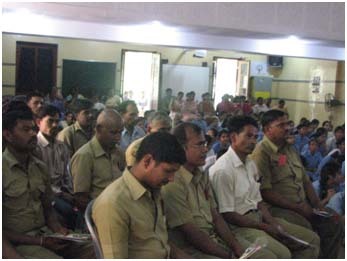 They interacted with the inmates of the shelter homes, slum dwellers and special children. It gave them an opportunity to see the difficult situations in the society and the struggle associated with it. The students distributed food packets, toiletries, clothes, stationery etc. The experience taught the students to find happiness in each moment of life. 1. 23/04/14 VI Visited NavJyoti Blind School ,ApnaGhar and Strangers Home. 3. 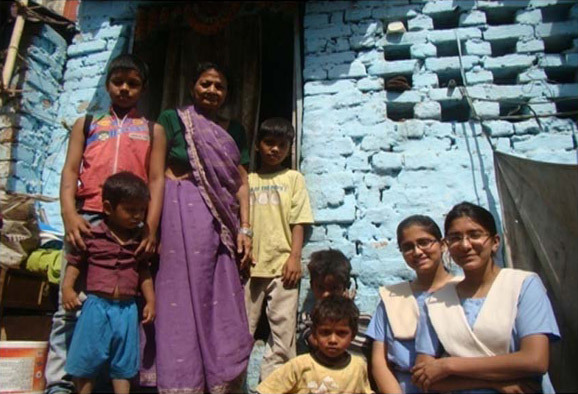 23/04/14 VIII Visited RajkiyaBalGrah, Lucknow Children’s Home &LeelavatiMunshiNirshritaBalGrah. 4. 05/05/14 IX Visited Buddha Vihar – Slum Area near the School, ManishaMandir Orphanage, Gomti Nagar and Blue Haven, Christian College Campus. 5. 05/05/14 X Went to Buddha Vihar- slum close to the School, Karunalay Orphanage for Mentally Challanged run by the M. C Brothers and NurManzil, Lucknow Psychiatric Help Center. 6. 05/05/14 XI Visited Buddha Vihar- slum close to the School, Pyssum day Care Centre for mentally and Physically disabled children and Cheshire Home for disabled and chronically ill persons. 7. 23/04/14 XII Went to PremNivas, SapruMarg run by the Sisters of Charity, RajkiyaBalGraha, Lucknow, Buddha Vihar Colony and NavyaJyoti School for the blind in Mohanlalganj. 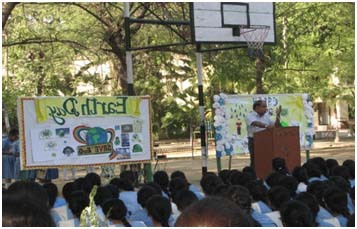 Earth Day was celebrated on 25thApril by organizing a special assembly. 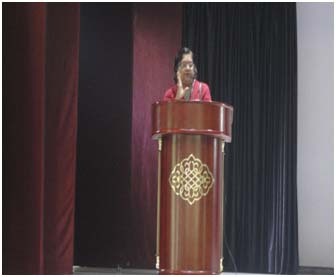 A talk was given to the students and the staff by Dr. P.K.Srivastava( CDRI, Lucknow). 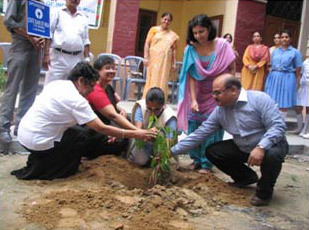 The programme was organized by the Environment club. Dr. Srivastava enlightened us on the medicinal plants and trees and gave us very simple tips to stay healthy and fit by following easy food habits like eating herbal and organic food. He also told us the right way of storing water in the refrigerators, correct use of plastic containers etc. Our students asked him many questions and he willingly cleared all their doubts. A quiz was also held to mark the occasion in which the students participated enthusiastically and won prizes. In the Junior School various activities were organized to mark the Earth Day like creative Writing. The Whole School decorated their soft boards on the preservation of environment. Labour Day was observed on 1st May, 2014. A special assembly was held to seek God’s blessings on all the members and their families. Our Superior, Sister Helen, gave away the gifts to the domestic staff members. 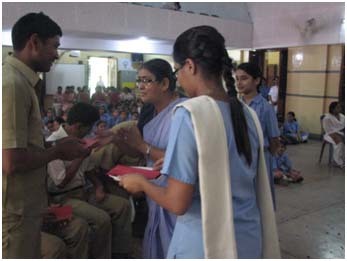 The students read out a couplet on each domestic staff member to acknowledge their contribution to the school. The students gave flowers and cards made by our own students to the special guests of the day. An entertainment programme was presented by our students and the students of Jagriti Loreto Vidyalaya. Games were also conducted to add fun and spice to the celebration .A Quiz on cricket was held in which the members participated and enjoyed thoroughly. The other games included tying of tie, folding of saree and separating of mixed cereal grains. Prizes were given by Sister Josephine. The celebration ended by a vote of thanks by the domestic staff. Ms. K.Khosla from City International School, Lucknow gave a talk on ‘ Global Dream’ , a project about teaching underprivileged where school children participate actively in teaching poor children in their vicinity.Two Ex- students gave a brief introduction about “Each One Teach One Programme” to the students from class VI to XII on 9th May, 2014. Kits were distributed to the children who wished to teach children during their summer vacation. Tree Plantation Drive took place on 1st August, 2014. 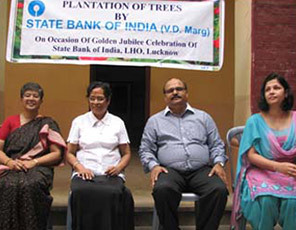 The drive was organized by the State Bank of India to celebrate their Golden Jubilee. Students of the environment club, teachers and our Principal Ma’am George were present to mark the occasion. 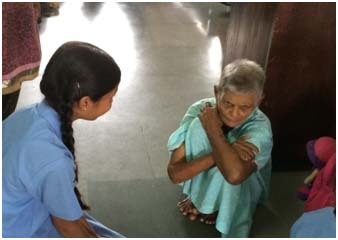 Students of the junior school went for social service on 8th August, 2014. They interacted with the inmates and distributed food packets, toiletries and various other items of daily use. Visit to Prem Niwas, Mother Teresa’s Home for the Elderly. Junior School Children interacting with the inmates. Oral B Group has arranged a check up on 25th September, 2014 by Dr. Abhishek Tiwari and his team. 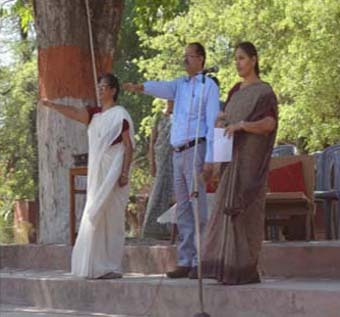 On 25th September, 2014 Dr. D. N. Shukla and Dr. Ritu Srivastava has given a talk on "Dengue Fever Precautions"
The girl students of Jagriti Loreto Vidyalaya participated in the event held in La Martiniere Girls College on the occasion of International Girl Child Day on 11th October, 2014. They took part in many races and competitions and won many prizes. 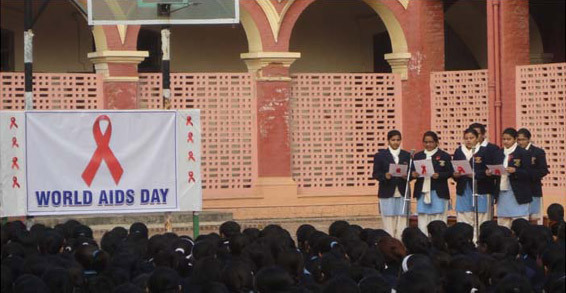 World AIDS Day was observed in the school and on the occasion a prayer service was held by the students of the Dramatics club on 2nd December, 2014. The students also performed a Street Play (Nukkad Natak) to spread awareness on the scientific facts and the myths associated with the disease. Badges were distributed to the teachers , students and all the members of the school to show solidarity and empathy with the patients and raise issues on the disease in the society. Human Rights was celebrated on 12th December, 2014. 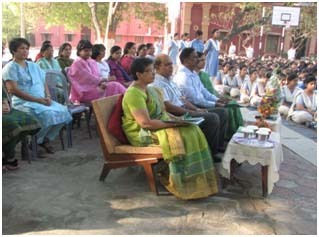 The students of the Computer Club Organised a Prayer Service. A talk as given by Dr. Snehalata Tripathy, Head of the Department of Education, Lucknow University on the Human Rights Convention, Rights of women , child rights and the violation of rights by persons and the state. Due to the serious threat of swine flu in the city, a talk was given by a team of doctors to sensitize the students and teachers about the disease. Masks were arranged by the school from Nagar Nigam, Lucknow and distributed to the students for a nominal price to stop the spread of the disease. A “Clean Lucknow” drive was conducted by the School under the guidance of our Principal, Ms. L. George. Various Groups of different classes along with a few teachers cleaned the nearest localities in batches collecting litter thrown around the area. 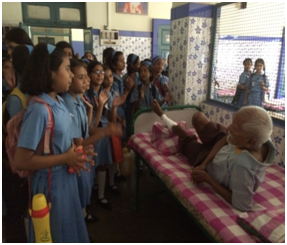 Students of classes VI - VII continued to go to Jagriti Loreto Vidyalaya as part of their Community Service. Students of Jagriti Loreto Vidyalaya participated actively in all the events organized by Loreto Convent Intermediate College, Lucknow. Several activities were also organized for the students in Jagriti Loreto Vidyalaya for the holistic development of the students. Supplementary food, egg and fruits were distributed by generous parents of Loreto College time and again. Inter school friendly matches were held between the students of Jagriti Vidyalaya and Pushpa Vidyalaya. 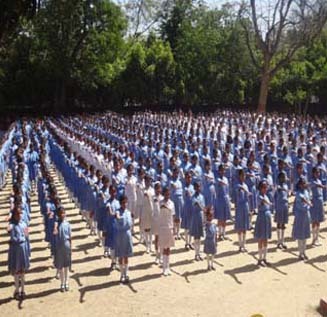 The students of Loreto convent cheered and encouraged the students. Breakfast consisting of bun and bananas, midday meal consisting of pulses, vegetables is given to all the students of Jagriti Vidyalaya to fulfill the nutritional requirements of the students. Midday meal and breakfast is provided to the students of Jagriti Loreto Vidyalaya to fulfill the objective of Goal 1 of the Millennium Development Goal to eradicate extreme poverty and hunger. Wheat flour was also distributed to the students donated by a parent of our school. Tiffin sharing is done by the students of the junior school on every Friday. 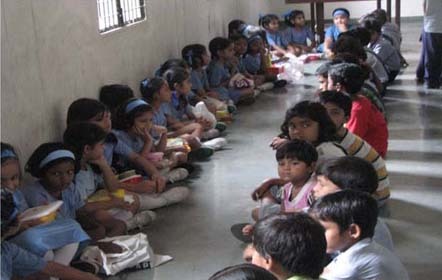 The students go class -wise to Jagriti Vidyalaya and have their food with the students there. These make them aware of the social difference and respect the marginalized.